Last year the UK Beauty Industry was worth a whopping £4 billion in sales. In a crowded market place it can be difficult to know what's worth the hype and what's not. I'm really selective with my skincare purchases, opting to shell out more for a few outstanding products rather than filling up the bathroom cabinet with stuff I will most likely never use. As we all know I don't have much time for a skincare regime. I've got better as I've got older, in part for fear that my face will collapse outwards and start resembling the wrinkles of a Pug. But that said my skincare routine still leaves a lot to be desired. 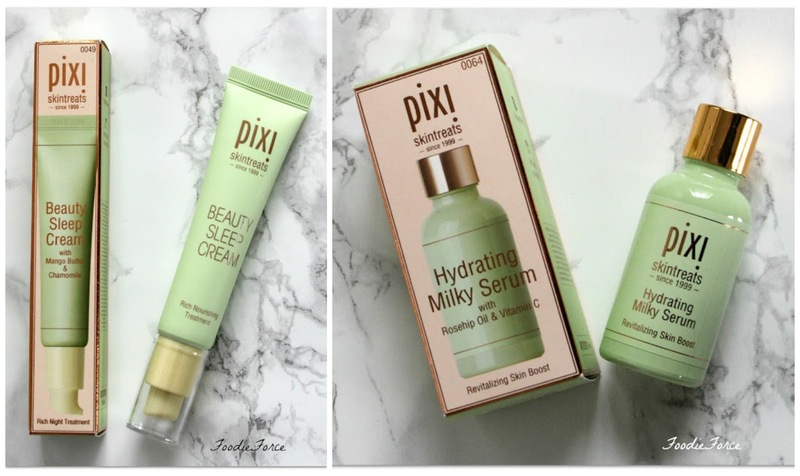 I've tried and really liked a few Pixi Beauty products over the years. They first featured on my blog last year (you can check out the post here). If you haven't heard the hype about the partnership between Pixi and beauty guru Caroline Hirons (Facialist, Skincare Expert and Blogger) collaborating on the Double Cleanse (£23) then you must have been living in a cave. On a personal side note I really love Caroline because of her no nonsense attitude to skincare. She tells it like it is and if anything is recommended by her you know it is based on years worth of experience in the beauty industry. So with that said I had high expectations and hopes for Double Cleanse. The concept of having two cleansers in one product seemed great. The first step to using the product is taking a coined sized portion of the solid cleansing oil and rubbing onto a dry face. I found that the product was brilliant for taking off my makeup. The product has no scent so great for sensitive skin. Once the product is rubbed in, use a damp facecloth to take it off. I personally prefer using a muslin to take the cleanser off. The feel of the product is remarkably similar in consistency to the Clinique - Take The Day Off Cleansing Balm (£24). The second step is using a coin size of the cleansing cream, massaging thoroughly in and again removing with a damp cloth. I like that it is easy to use and that you have a clear stepped process to cleansing. The cleansing cream is incredibly lite which for me I loved, but for some people I imagine this will not be what you expect and some might want something thicker. The ingredients are 100% cruelty free; this product also uses wonderfully moisturising Avocado, Macadamia and Evening Primrose oil. I loved how my face felt thoroughly cleaned after using the double cleanse. After a few weeks of use I noticed the difference in my skin which looked brighter, with less spots and wasn't dehydrated. I absolutely hate the packaging which is bulky, ridiculous for travelling as the cleansing cream spills onto the top of the lid and into the cleansing oil. This is definitely style over the considered use for the product. If like me you don't use makeup everyday you will find you go through the cleansing cream quicker. I am now left with a third of the solid cleansing oil which is slightly frustrating. I hope that they will consider releasing the two products separately at some point. For those amongst us who worry about bacteria, I would have liked a spatula in the product to decant. But I guess given that your using it daily, the product will be gone in just over a month therefore not a deal breaker. In conclusion I would definitely buy this product again; it's reasonably priced and makes double cleansing an easy joy. I do however have the Emma Hardy Amazing Face (£39) on the wish list, so who knows if it will survive in my must haves. I will let you know in a few months when purchased and reviewed. Any good suggestions for cleansers or beauty products I need to add to my shortlist? Finding time to go out for meals with friends and a toddler in tow is a challenge; a lot harder than I had appreciated. When Noah was first born he would happily sleep or coo through an entire meal. However, as soon as he reached seven months he was on the go all the time needing constant entertaining and as such eating and enjoying it became a very different story; even stressful at times if he hadn't slept. So when friends suggested a catch up over breakfast without Noah, I had one thought in mind; wherever we went it had to be good. I've spent a large amount of time recently thinking about food and a relaxing meal out. I've even been salivating at cookery programmes on television. The Modern Pantry just off Finsbury Square has been on the foodie list for a while, as it combines two loves of mine, food and beautiful architecture. 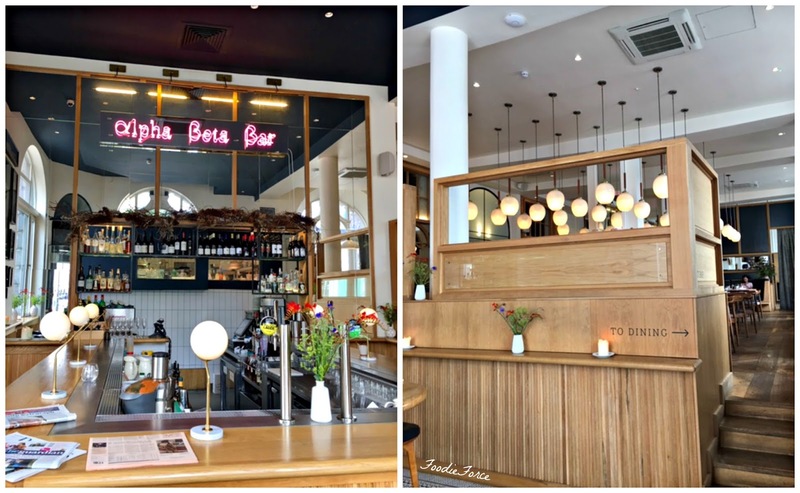 The Modern Pantry is set in the beautiful Art Deco grade II listed Alphabeta Building. The historic exterior hides a modern architectural delight which has just recently undergone a huge reinvestment. Its updated atrium and the first ever ride in cycle ramp are two such changes. I Imagine that you could in theory cycle almost to your desk, should you wish too that is. It even houses a basket ball court and terrace offering amazing views of London's sky line. 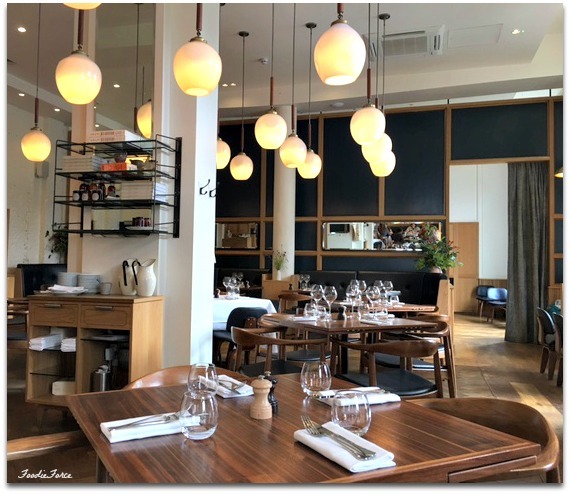 The design of the The Modern Pantry is in contrast to the office space next door, with the restaurant opting for crisp white lines, high ceilings that any interior designer would be envious of, beautiful Walnut tables and orbed lights. Their breakfast and brunch menu (7.30-11.30 am) offers lots of choice from fresh fruits, muesli, pancakes, omelettes and cooked breakfasts. My friend like me has been dreaming about her breakfast long before we step inside, in fact she had studied the menu before coming. 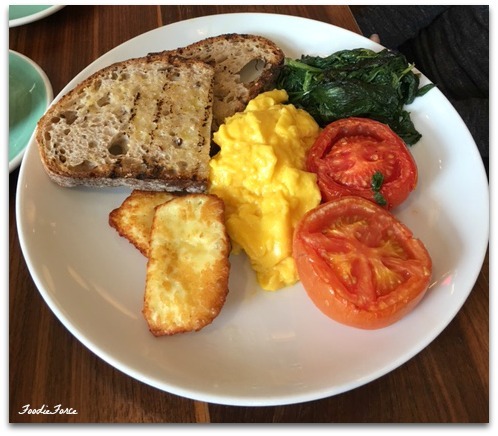 She chooses scrambled eggs, toast with; crispy halloumi, buttered spinach, lemongrass roast vine ripened tomatoes (£10.50). I'm reliably informed that it was delicious. Especially the scrambled eggs which were perfectly cooked moist and creamy. 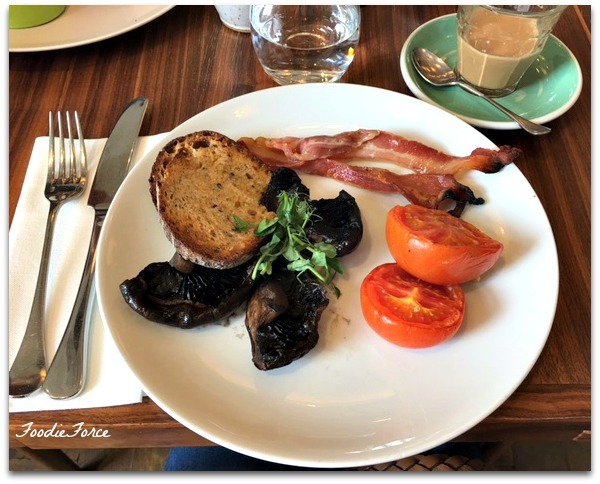 I opt for grilled smoked streaky bacon, coconut & soy braised Portobello mushrooms, lemongrass roast vine ripened tomatoes (£10.50). It does come with two eggs and I ask if I can substitute them out, to which I'm quickly advised they don't do substitutions. So I choose halloumi cheese (£2.50) instead to go with my breakfast. 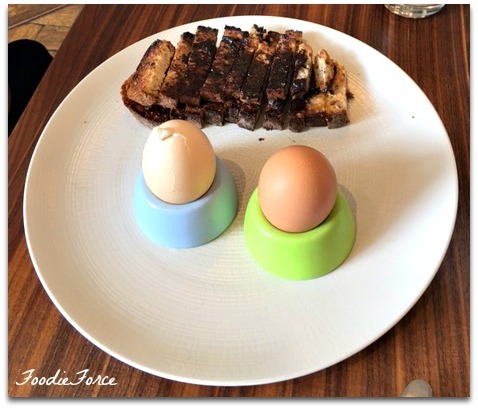 The final choice on the table is two soft boiled eggs, buttered Vegemite soldiers (£6.00). 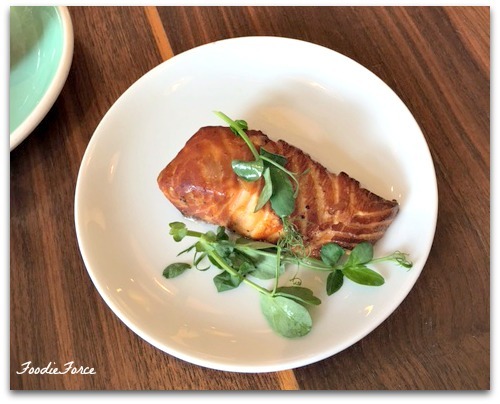 With an addition of hot smoked scotch salmon (£4.50). 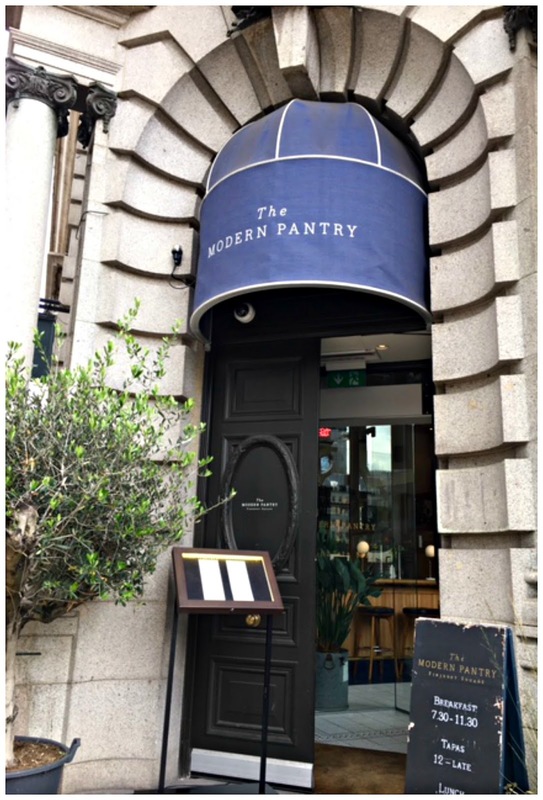 I had really high expectation for The Modern Pantry but the service for my taste was a little too relaxed. With only six tables occupied, the restaurant was nearly half empty, the service was underwhelming and nearly non existent. 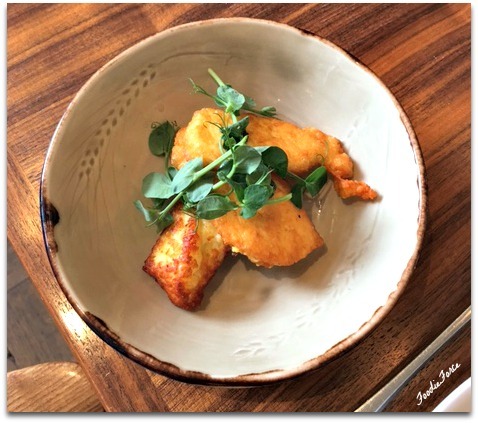 The food whilst lovely and fresh was small and considerably overpriced for what you get. I did however love the ambience, the environment is spacious with wonderful lighting and a lovely place for a catch up. So if you want a very relaxed breakfast in the heart of the City in a beautiful environment, can over look the price, then The Modern Pantry is a good offering. Do you have any good breakfast or brunch suggestions for me?